In case you’re new to this blog, we have been having a drawing each month recently that awards a free hand-held jump starter to a lucky customer who submits a picture or two of their new car lift, tire changer or air compressor to us. The rules are pretty simple; just submit a picture, and you are entered. Then, we have a random drawing that chooses the winner. Our favorite pictures are those that show our customer’s home garages with their brand new auto lift along with their favorite vehicle perched up on top. Very cool stuff. There are lots of nice garages and “man-caves” out there. Shops that service trucks have used many various different methods over the years to dismount and mount tires to these big, heavy rims. But most options are still either difficult and cumbersome or very expensive. 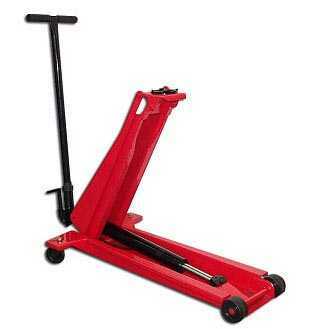 Enter the Easy-Way truck tire demount tool. It was made specifically for dismounting these difficult tires. It has a truly innovative tool design that allows for a quick, painless, and as the name describes, easy way of dismounting these wheels. Sure, you could purchase a big, expensive automatic truck tire changer. Heck, we carry several of those, and if you want to purchase one, we would be glad to sell one to you. But if you want to save a boat load of money, and still get the job done, you cannot go wrong with this handy little piece of equipment. The best part is that it really work. Check out the video link below and see for yourself why it’s a no-brainer to get this tool. Check out the new R30XLT tire changer by Ranger folks! It’s here and it’s now in stock and ready for shipping. This new tire machine has all kinds of cool features, but the thing we like best is it’s range. This machine can handle all the way from 10 inch rims all the way up to 33 inch rim diameter. That’s a pretty wide range. It has a power assist arm to help you change those fancy and expensive low profile wheels. It has a powerful 2 horse power motor. It has the new Ranger “NextGen” jet blast bead seating system with the large air storage tank so you’ll be able to seat the beads of pretty much any tire that can fit on this machine. And there’s so much more, such as the rugged forged steel foot pedals instead of those cheesy cast steel pedals you typically find on most machines out there. It has all of the quality you’ve come to expect from the Ranger name, along with the reasonable price you’ve come to expect. Now just what do you think you would have to pay for a tire changer packed with all these features? $5000? Maybe $4000? Forget about it. How ’bout only $2985 with free shipping? That’s right. Nowhere will you find such a great bargain as this. We cannot guarantee this price for long. Just give us a call for more details or visit our web site. You’ll be glad you did. Too many customers call us in a confused state. They claim there are so many different types of tire changers and so many different manufacturers that it’s difficult for the typical technician to know what to get. Don’t worry. That’s why we’re here. Our job is to help you understand the variety of options available to you and to help you make sense of it all. We’ve created a primer on all things tire changer. This article has appeared on one of the premier informational article web sites – Hub Pages. It explains all of the differences between the different types of tire machines available today and what factors to consider when making a purchase. It’s a must-read for any technician or auto shop owner. Check it out by clicking on the link below and get back to us with any question. Did you ever have a hard time seating the bead of a tire on your Tire Changer? Many modern rim clamp tire changers have an air tank in the back of the unit, and hoses that lead from the air tank to the jaws that clamp onto the rims of the wheel. Once you’ve mounted the tire to the rim, the next procedure is to step on a pedal to shoot a rapid blast of air into the tire to seat the bead of the tire while it is on the turntable. Problem is, sometimes this can be a difficult process for various reasons. Many rims are shaped and contoured in such a way that the direction the air jets on the jaws are configured, much of the air blast ends up shooting out the other side of the tire. Sometimes the air tank on the tire changer just isn’t large enough to handle full size truck tires. In these cases, many customers get a jet blast tank to assist. These jet blast tire bead seating tanks are stand alone air tanks that have a nozzle on them to assist in seating the bead of the tire. We carry the new Cyclone Tire Bead Seating Tank made by the same folks who invented the popular Cheetah valve tanks. This five gallon tank has a proprietary butterfly valve that assures rapid and complete air exchange. Air gauge and easy to adjust nozzle make operating this thing a breeze. And don’t worry, this thing works on tires up to 24.5″. And the best part? – It’s Made in the USA. The new Ranger Next Generation Tire Changers have many features you would find on a premium machine. We could tell you about the powerful two horsepower motor, significantly larger than most machines on the market today, which typically have a 1.5 HP motor. We could tell you about the forged steel foot pedals, which are less likely to break under rough shop use than the typical tire changer, which usually has cast steel foot pedals. We could tell you about the wide range that the machines have when it comes to rim diameter capabilities. There are so many reasons to purchase a Ranger Tire Changer now. But this post is not about those features. It’s about the powerful Jet Blast system that these tire machines have. The innovative design delivers a rapid blast of air where you need it, when you need it. You will be able to seat the bead of pretty much any wheel that fits on the tire changer. And it’s quick. Just pull the hose / nozzle assembly over to your wheel while it’s on the turntable, position the nozzle into the tire, and let the machine do the rest. It takes just seconds and gets the job done right the first time. Check out the short video below and see just how simple it is. Then get back to us with any questions.